What up y’all?! 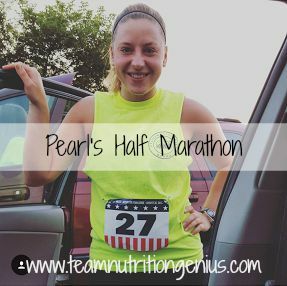 Last weekend I crushed out my second half marathon which was a big accomplishment for me for a few reasons. First, it’s running 13.1 miles I mean who does that for fun?? Second, because on April 1st, 2012 I was hit by a car. I was getting out of a cab and crossing a street when a red light turned green and a car started towards me. I froze, unsure of whether to continue across or retreat. When I saw how fast the car was going I realized I needed to get out of the way, and quick. I took a step back with my right leg and then was hit on the inside of my left. Whammy! I’m sure my brother didn’t appreciate the call describing a seemingly April fool’s day joke turned real, sorry Scottie. I was in so much shock when it first happened that I didn’t even cry. My friend Bridget was visiting me at the time and she said I looked up at her from the pavement with a half smile on my face and said “Bee, I think I should go to the hospital.” When I got to the hospital I found out how super lucky I was. I had small tears in just about every tendon, ligament, and muscle group in and around my knee joint but no complete tear and no breaks. One killer bruise. As I sat in the hospital bed waiting for the test results and staring at my leg in a brace it hit me- I wasn’t going to be able to run. For the first time that night I started crying like a little fetus. For many people this would be a delightful excuse to not run, but not for me. I was devastated. Let’s rewind a little bit. Running was NEVER enjoyable for me. I played softball all throughout my younger years and I was always teased for my speed. It just wasn’t my thing. I started running a few times per week when I was in college and three years later a friend asked me to participate in a Ragnar Relay. Ragnar is an overnight running relay with a 12 person team that covers around 200 miles. Call me crazy, but it sounded like fun. I ended up being unable to participate in the race due to a work conflict but the training helped me to build up my endurance. I enjoyed the training so much that I decided to go for it and signed up for a full marathon. After months of training and building up to 16 miles I developed iliotibial band syndrome that cause intense pain in my left knee. After a month of rest, stretching, strengthening, and an unsuccessful cortisone injection I finally had to face the truth- I wasn’t going to be able to run the marathon. This was another time I cried like a little fetus. I had worked so hard to get to that point and the feelings of frustration, failure, and sadness were so overwhelming. I just wanted to run. It had become such a regular part of my routine and I loved the early mornings watching the sun rise and gathering my thoughts before the day. I felt like I wasn’t just losing the ability to run a race, I was losing my time to center myself, a part of my sanity. It took a few months but eventually I started running semi-regularly again and by December 2011 I ran my first half marathon. It was then I decided I wanted to try for the full again. It was about a month after I started training again that I got hit by the car. I went through six months of physical therapy and countless appointments with orthopedists, neurologists, and chiropractors. The final consensus was there would always be a spot on my knee I wouldn’t have feeling in and I should take NSAIDs for the daily pain and inflammation. Uh, what? That just wasn’t acceptable to me. NSAIDs are known to be damaging to the GI tract and living in daily pain was just not going to happen. So I stopped running. I found other ways to exercise, hiked no more than once a week, and just iced my knee when it hurt. I gradually was able to increase my tolerance and I joined a once per week running club for fun but still missed the consistency of training and the early mornings clearing my head. Then a few months ago I found a running ID bracelet. I hadn’t been arguing any of the limitations the car accident put on me. After reading it I thought back on the progress I’ve made. I realized I have built my leg strength, I am able to run moderate distances relatively pain free, and hiking upwards of 10 miles is rough but I can do it. I realized it was time to start arguing again. Bone Broth– Bone broth is a traditional food made by slow cooking animal bones, water, vinegar, celery, carrots, onions, and garlic to make broth. The use of an acid (vinegar) helps to draw minerals from the bone into the broth which gives you the added nutrients when you consume it. Bone broth supplies amino acids crucial for the immune system, GI tract, and collagen growth and can act as an excellent source of post-exercise electrolyte replacement. Vital Proteins Collagen Peptides– Collagen is one of the most important proteins in our body. It is a component of our tendons, ligaments, skin, cartilage, bones, teeth, blood vessels and GI tract. Given that the tendons and ligaments in my knee needed a little TLC I chose to supplement with this nutrient. Though during digestion our body will break down the whole proteins found in meat cooked on the bone, research has demonstrated consumption of collagen peptides can lead to an increase in these peptides in the blood which can lead to an increase in fibroblasts, the cells that produce collagen. Eating both meat cooked on the bone and supplementing with Vital Proteins helped to give me the building blocks- amino acids and peptides- needed to increase and strengthen proteins in my body. Vital Proteins obtains their collagen from pastured animals from farms that use eco-friendly practices so it’s a company you can feel good about supporting. Young Living Pan Away Essential Oil– This essential oil is a blend made from a combination of Wintergreen, Helichrysum, Clove, and Peppermint oils and was a delight after a long run. It supports muscle and joint health and has a great cooling effect when applied topically. Massage and Foam Rolling- An injury in one place in your body can have ripple effect throughout the rest tightening other muscle groups and increasing stress on other joints. Massage helps to break up trigger points, relax contracted muscles, and stimulate blood flow to the area. Many health savings accounts pay for massage so if you have one of these through your workplace check into it! For more information on foam rolling check out this podcast by Ben Greenfield who knows a heck of a lot more about it than I do! Ice– I didn’t have to do this often, but when the inflammation in my knee got to be too much I would ice it rather than pop pills. Icing reduces blood flow to the area so should only be used in acute inflammation, not as a routine thing. A decrease in blood flow to the area will further slow healing. Real Food- You knew I was going to throw this one in there. Eating real food, meaning plenty of fruits and vegetables and nutrient-dense animal products, will give the body the building blocks it needs to build muscles and joints. Not only that, this low- carbohydrate style of living is anti-inflammatory which is a beautiful thing for someone trying to heal. I finished 4 minutes faster than my last half marathon, 2/34 in my age group, 19th of females overall, and 60/292 total participants. And best of all I did it without any nasty hateraid and chemical-filled energy gels. In fact, I ran the entire race fasted meaning I didn’t eat before I ran. Think I’m crazy? I’m not, I promise. You liver and muscles store glucose in the form of glycogen which your body breaks down to glucose and then uses the glucose to make ATP, the cell’s energy currency. When you exercise you deplete your muscle glycogen storage and, in between activity, it is repleted by the food you eat. Conventional sports nutrition knowledge tells us we need to eat a high carbohydrate diet to quickly replenish these stores and research does support this. But here’s the thing. Much of this research looks like this- participants into two groups, one consuming a high carbohydrate diet (~70%) and one consuming a low carbohydrate diet (~40%). Participants are then exercised to exhaustion three days in a row and glycogen stores are measured. Well of COURSE someone consuming a high carb diet would have better stores. But the way that research is conducted in not the way I was exercising. I was running four days per week with a full day of rest after my long run and a two week decrease in training leading up to the race. So it didn’t make sense to me to attempt to jack up my carb intake especially when that can lead to an increase in inflammation. Additionally, it is possible to become what is called fat-adapted. When the body runs out of stored glycogen it will begin to break down higher amounts of fat through a process called beta-oxidation. Overnight, liver glycogen which maintains blood glucose levels, becomes depleted and the body shifts to beta-oxidation as the primary way to obtain energy. When we consume carbohydrate the body shifts back to glycolysis (breaking down glucose) as the way to obtain energy. But if you don’t ever consume carbs your body will just happily go on with beta-oxidation. While research also demonstrates better performance outcomes when operating primarily on glycolysis it is possible to become fat-adapted where performance does not decline with your primary energy system being beta-oxidation. Since I consume a lower carbohydrate diet and I ran most of my long runs completely fasted and was happy with my results I decided to go for it at race time. This article isn’t to say that everyone should do fasted exercise. Individuals who struggle to control their blood sugar should most certainly not jump right in to fasted exercise. Everyone’s body is different and what will work for you will be different. That being said, fasted exercise does have lots of health benefits. For more information check out yet another Ben Greenfield podcast here. For this race I did what made me feel great and what I practiced ahead of time. Your nutrition regimen should always be tested prior to competition to work out any kinks that may make you feel crappy and not perform your best. I’m not sure I’m ready for a full yet, but I’m very pleased with how this race turned out! Alright now lets hear it from you! Have you had an injury holding you back from something you want to do? What have you been doing to heal and get back to the things you love?